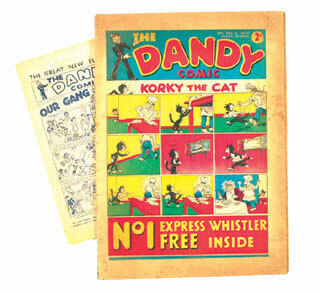 DANDY COMIC No 1 SELLS FOR £7,261.00! The last time we offered a Dandy comic first issue was in June 1999 when it sold for £4,840.00, so the price for this D C Thomson classic piece has increased by 50% in the intervening five years. With only nine or ten copies known to exist The Dandy No 1 is rarer than its Beano counterpart which has thirteen issues noted. 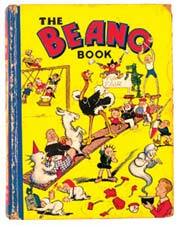 Talking of Beano, we received a very firm price for the first Beano Book from 1940 which realised £3,872.00 including 10% buyer's premium. 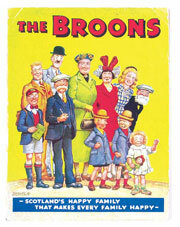 The Broons Books prior to 1952 are very hard to find and this copy with some front cover foxing made Pa Broon's smile a wee bit wider at £907.00. We sold a similar graded copy in September 2003 for £1,391.00 so prices can fluctuate quite strongly around the thousand pound mark depending on what is offered at auction at any given time. 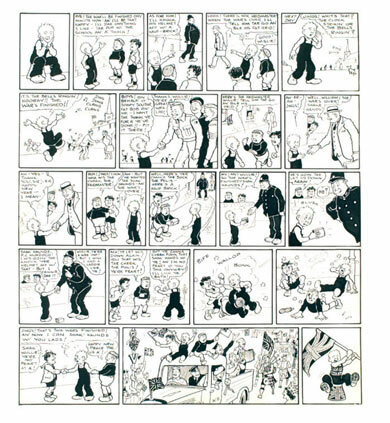 With the sixtieth anniversary of D day coming two days before the close of our June auction there was no doubt that Oor Wullie would be in on the wartime action and this wonderful artwork for the Sunday Post by Dudley Watkins showing the wee lad leading the VE day celebrations was chased up to a record £2,256.00. Arthur Jackson's politically incorrect Musso The Wop artwork from The Beano 167 of 1941 was sold at £330 as the hapless dictator begged for presents from Beano readers to help him sleep - of course they didn't! Hitler and Goering were also brilliantly satirised during the war years and an example of Sam Fair's "Adie And Hermy" artwork for The Dandy where they are merrily singing " Hang Out The Washing On The Seigfried Line" realised the same price. These propaganda artworks often cross the line into social and political history and are all the more collectable for that. But most importantly they retain their wonderful sense of humour and D C Thomson's artists and writers always started from that point. 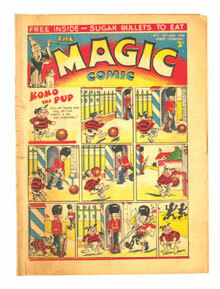 Magic Comic was the third sibling in the Beano and Dandy stable but the title only lasted for eighty issues, becoming a victim of wartime paper shortages in 1941 with Beano and Dandy having to alternate every other week for the same reason. 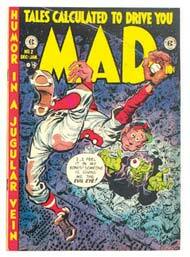 All eighty issues of Magic are rare and we auctioned a No 1 in Good Plus grade for £1,331 including buyer's premium. 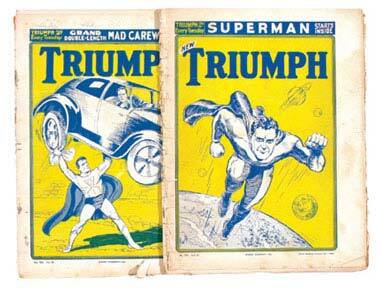 Normally the sale of Amalgamated Press title, Triumph comics would not cause much interest, selling as they do for a few pounds a copy in average condition. 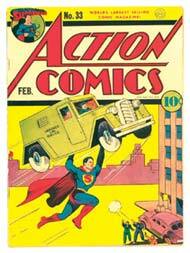 However, issues 771 - 791 from 1939 featured the first UK reprints of Superman and lot 53 offered eighteen issues starring the Man of Steel albeit in the lower grades of Good/Very Good. They ended up flying to £618, or just over £34 each. There was a comprehensive run of Dandy early issues offered individually and numbers 11to 15 made £150-220 each with numbers 16 to 27 in lower grades around £60 each. We had a later run between 63 and 100 and these averaged £70-100 a piece. Our September catalogue will feature some early Beanos of the same vintage, again all offered in separate lots. 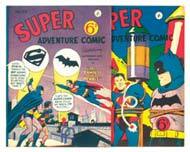 Atlas or Australian reprints of Batman and Superman have usually been sold for three or four pounds each up until recently but the continued upward revaluation of their original US counterparts has focused much more attention on these much more affordable sixpenny substitutes. We offered twelve lots which ended up averaging £6-10 a copy in mid grades with the Australian reprint No 4 of Superman's origin making £43.00 and No 9 closing at £24.00. There is a further selection in September. Our US Golden Age section was highlighted with Action Comics #33 selling at £375 and Detective #120 at £290 with a scarce copy of Top Notch #3 starring The Wizard just below £200. We featured a selection of first and early issue horror titles this catalogue, starting off with the charming radiation cover of Black Cat Mystery #50 which in Very Good Minus grade reached £171.00. 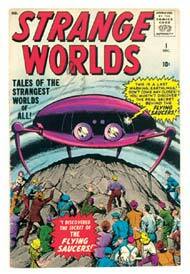 Dark Mysteries #1 made £143.00 and Fantastic Fears #5 featuring Steve Ditko's first work made £105.00. There are further horror key issues to follow once you have recovered from this selection. 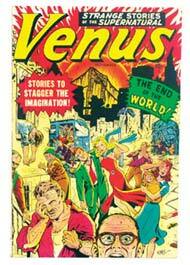 End of the world covers also made their mark with Venus #11 captivating £110.00 and Strange Worlds #1 with Kirby and Ditko's flying saucer cover taking off to £176.00. 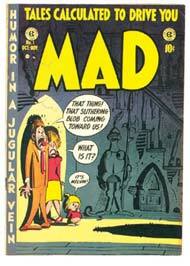 The satirical humour, albeit in a jugular vein, that characterised cool in the late Fifties is well out of fashion now, but MAD #1 and 2 still find determined buyers and our first issue Fine Minus copy made a gap-toothed £775.00 with number Two a (dis)respectful £176.00 in Fine Plus. 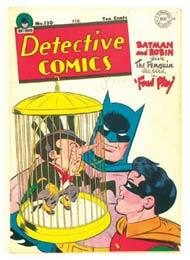 Alfred E would be so proud. When Amazing Fantasy #15 launched Spider-Man in 1962 Marvel's Monster turned super-hero titles really came of age and our well chipped cents copy was taken by a web bidder to £550.00. 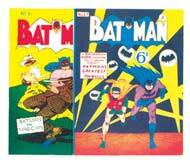 Please check our Prices Realised section for all the balance Silver and Bronze age results. Our continued thanks to all our buyers and sellers for making our catalogues what they are, we couldn't do it without you!